If someone parks their car on yours, just smile and understand there was surely a good reason to do so. Each country has a unique driving culture, with its own unique, culturally specific means by which its people might go about getting themselves killed. The way people drive in each country makes sense to the people of that country, and as often as not, those people only. For travelers and expats, one good survival tip is simply to figure out what the hell the locals are doing (which often isn’t that simple), then just do what they do. For those requiring slightly more information or practical advice on driving habits around the world, the following may not be much help. In South Korea, ineptitude appears to be the motorist’s weapon of choice. Never use your mirrors (except perhaps to apply makeup), and remember it is vital to always get there first, wherever that is, no matter. When you reach your destination, just park anywhere. In a country more densely populated than China and India this can all seem a bit overwhelming to non-Koreans. Driving in New York, a Mr Kim and Mr Park encounter some K-difficulties. South Korea however is far from the most dangerous place to hit the roads. Statistically (based on traffic related fatalities per 100,000 people), there are actually 102 countries (of 183 listed here) that fare worse. The majority of these are in Africa and South-east Asia. 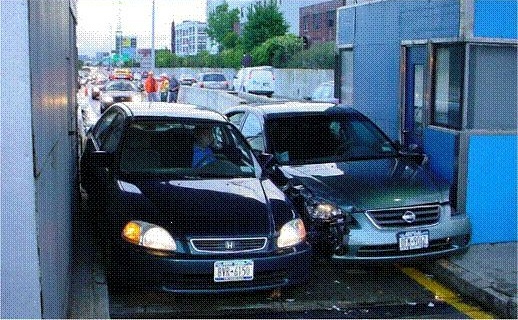 In America a high proportion of motorists seem to be at least 85, senile and blind… or drunken/texting teenagers. Everyone else is possibly at work or the mall (though this is purely speculation). In any case, be mindful of members of these ‘Merkan motoring minorities. They number in the tens of millions. With 10.4 road fatalities per 100,000 people/year, the US is well below the global average of 18. Regardless of the fact that 92 percent of deaths occur in low and middle income countries however, there remain at least fifty countries and territories safer than America, including Poland, the Philippines and Palestine. Vatican City (measuring one square kilometer) has a few vehicles, no highways (it does have a helipad) and doesn’t tend to rank particularly highly on lists of, well… anything really (except perhaps Percentage of Catholics by Country). It does however have a list of Ten Driving Commandments. These are pretty much like what you might expect, such as ‘Cars should not be used in anger to kill people’, and ‘Cars should not be used in lust to create people’… or something like that. 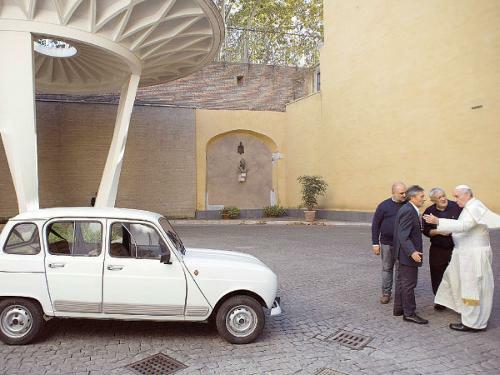 Road fatalities aren’t a driving issue in the Holy See. In Vietnam it’s best to get about by scooter, but never without at least three family members and some groceries. Minimum number of people allowed on a Ho Chi Minh scooter. 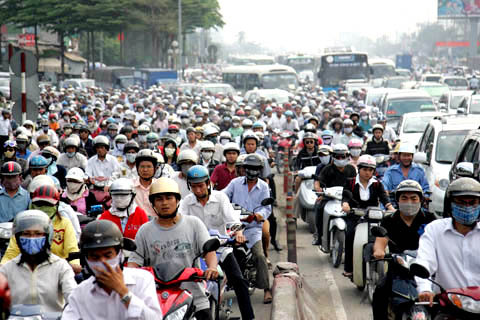 The Vietnamese vehicle of choice is economically viable and also practical, due to mild traffic congestion in the nation’s mega-cities. 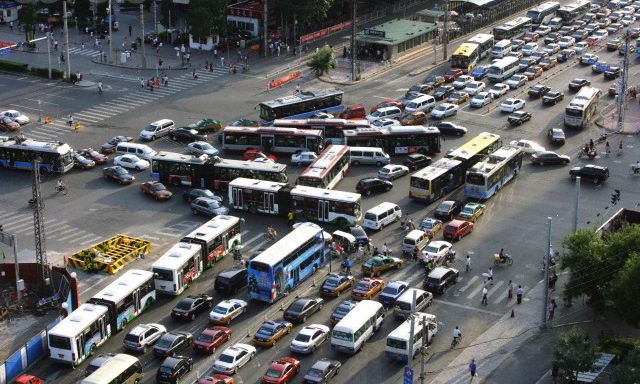 Pedestrian tip: if you really must cross the street in Ho Chi Minh, first take a deep breath, pray (if you’re so inclined) then walk into the traffic. Keep a straight line. Do not deviate, hesitate or stop for any reason. Seriously. … or just learn to be happy with whatever’s on your side of the street. In outback Australia, a drive should never be less than 700 kilometers and not without a beer between your legs (when reaching civilisation once more, remember that the left lane is preferable). With only 5.2 road fatalities per 100,000 people, Australia is actually one of the world’s safest countries for driving. This could be partly due to Australia’s low population density, and also because penalties for breaking the rules are, by international standards, very harsh. Being caught driving 45km/h beyond New South Wales’ variable speed limits currently results in a minimum fine of $2,197 and a 6-month license suspension. In Victoria, being caught using a hand-held mobile device gets the driver a $443 fine. Revenue raising police aren’t the only danger to Australian motorists though. Driving outside Australia’s coastal cities, you’ll eventually hit one of these. When driving in the bush, never swerve to avoid Australia’s famous 200-pound bouncing rats. They’re highly unpredictable, number in the millions, and collide with vehicles every day. 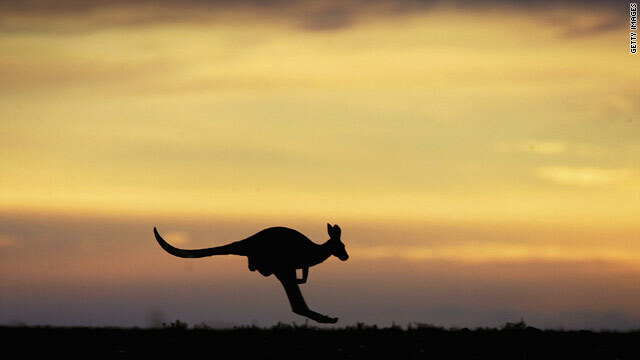 Swerving to avoid kangaroos does get people killed. 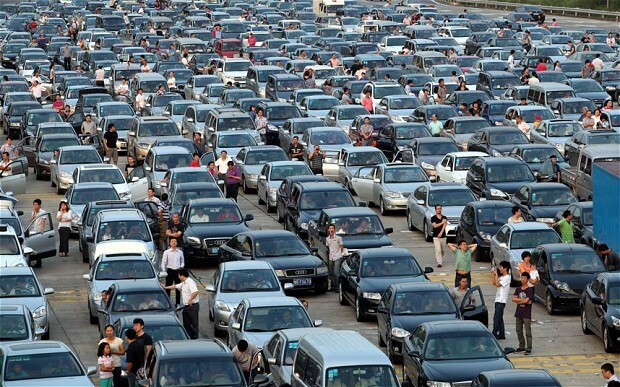 Holiday traffic in Shenzhen city, China. Visibility may be less than ideal. China’s statistics are staggering. 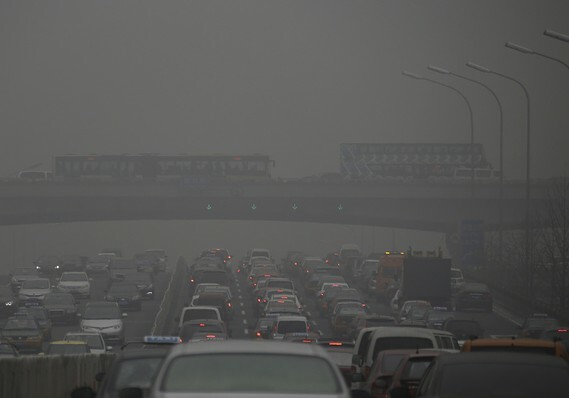 Over 260,000 people die every year on Chinese roads, and this probably won’t improve any time soon considering the number of vehicles jostling for space there now increases by over 50,000 every single day. Perhaps most frightening about all this is the fact that, statistically speaking, there are at least fifty countries more dangerous than China in which to drive (or walk). One of these is Saudi Arabia, listed here as having 23.2 road fatalities per 100,000 people annually. In the Kingdom of Saudi Arabia one must never drive anywhere less than 220 km/h, preferably on two wheels with your passengers seated outside the vehicle… highway lane markings are guidelines only. 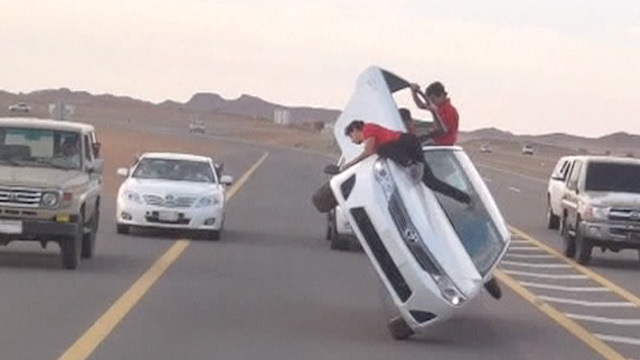 Approximately 100 percent of Saudi road carnage is caused by males. In Russia (thought by many to be the most insane place on Earth to drive), all motorists are required to be highly aggressive and unbelievably drunk. This is the law. 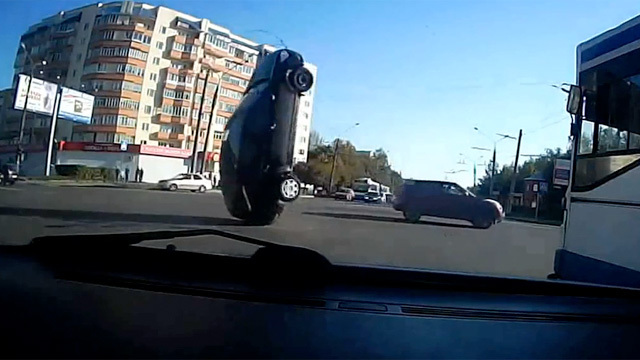 Russian drivers also must have a dash-cam recording at all times, so the drunkest and craziest in any given deadly situation can be determined for insurance purposes (and for providing thousands of hours of mind-boggling Youtube viewing to still-living people in other countries). Pedestrian tip: don’t. Just don’t. Eritrea, with 48.4 deaths per 100,000 people is by far the most dangerous place to drive. The North-African nation boasts poor roads, poor drivers, poor signage, and people on camels. Put into perspective, the roads of Eritrea are more than three times deadlier than those of Mexico, which incidentally are safer than those in the United States, according to these statistics. If you’ve made it this far, please feel free to disregard everything you’ve just read. Cheers. 2 Comments on "Driving Badly around the World"
Cheers HS, yeah I saw some crazy stuff in Cambodia too. What’s with the income gap there? Is there some Cambodian law stating that all private cars must be a Lexus?